From the streams and the forests. The discovery of gold in the foothills of the Rocky Mountains brought a hungry people to seek their fortunes. Overnight a community sprouted where the creek waters exited the canyon, at the the town site to be called Boulder. In 1859 it was still in the Nebraska Territory. A bare patchwork of roads, mostly following animal and native pathways, gave way to rugged toll roads. Slow and rough, costly and dangerous, these carried the goods required to sustain the mountain camps, returning ore for processing to Boulder and beyond. The great dream for those first twenty years was for a safer, more efficient means of getting people and goods back and forth--the railroad. In the early 1880s that dream began to materialize. 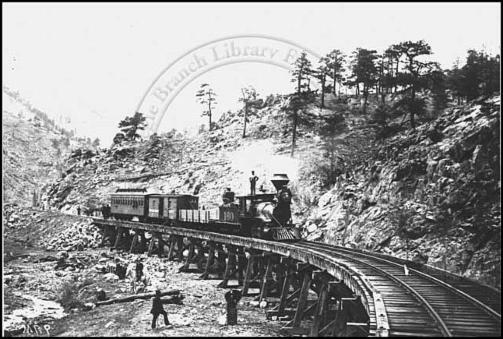 It came to reality in 1883 with the laying of tracks and the opening of the Greeley, Salt Lake & Pacific Railroad to Pennsylvania Gulch, at the head of Four Mile Canyon. The mountains and the plains fed each other. In the flatlands east, vegetables grew and coal was mined, providing the fuel for the mountain quest for gold, silver, tungsten. Boulder city was in the middle of it all as the growing center of government and business. The steel rail and the steam locomotive made it all work.